Going in, I knew nothing about the movie, except the promising promo picture of a woman standing in front of a strange looking house, as well as the fact that it was directed by Darren Lynn Bousman, whose lavish direction with strong, vibrant colors was the best thing about the first three “Saw”-sequels. 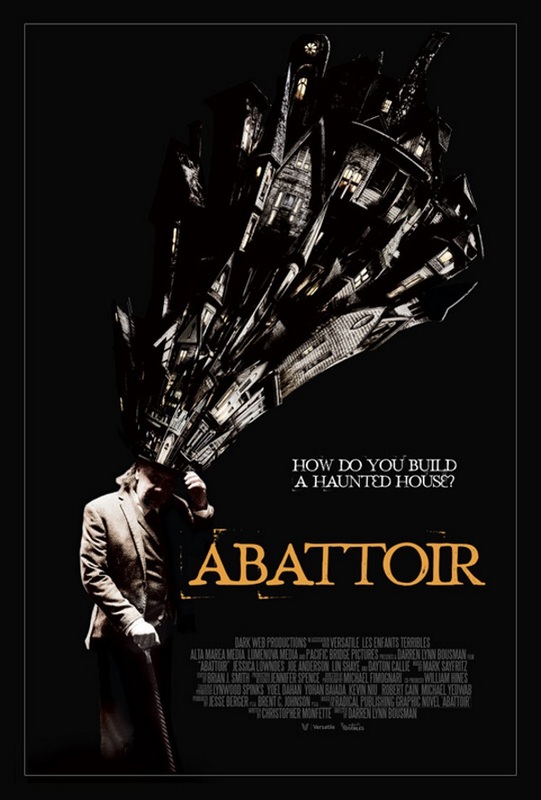 Fans of (t)his distinct visual style however will need patience when watching his newest feature, “Abattoir”, since the first hour looks so bland that it might as well have been shot by someone else. However, that’s a deliberate choice – which also means that visually, Bousman saves the best for last. Which in regards to “Abattoir” is actually true in more regards than one. Mind you, I did like the setup. The first couple of scenes, especially the murder, were quite chilling. Having no previous knowledge of what this is about, I was a little taken aback once the supernatural twist comes around, since I expected a more down-to-earth thriller. However, the idea itself was neat and unique, thus I adapted quickly. Unfortunately, after the first half hour or so, when Julia starts her investigation, the movie runs into danger of falling asleep – and so did I. Granted, this was my sixth screening of the day, starting at 1:00 am, so I definitely can’t rule out the possibility that it might have been easier for me to stay awake and pay attention had I seen it under different circumstances. Nevertheless, the middle part didn’t really grip me, and I had a hard time staying awake and paying attention to what was going on. It gets better again once Julia arrives at her home town, and visits Allie, played by Lin Shaye. And the last half hour was really quite good, not just because of the stunning visuals, but also due to some nice twists and turns as well as the motivation of the bad guy, which really surprised me in a good way. It probably helped that I like Dayton Callie, and thought that his performance here was very good. Unfortunately, Jessica Lowndes seemed to struggle a little bit with her role, at least to me, and Joe Anderson was rather bland. So acting-wise, it’s a little bit of a mixed bag – which actually sums up the movie perfectly in all other regards as well. This entry was posted in /slash, cinema 2016, movie reviews, new releases and tagged /slash, /slash 2016, Abattoir, cinema 2016, Darren Lynn Bousman, horror, thriller, USA. Bookmark the permalink.